Each Halloween my daughter and a few of her neighborhood friends exchange special treat bags. Sad to say that my daughter's are usually thrown together at the last minute because Momma (that's me) has failed to plan. This year I am trying to stay on top of things. This rather broad category of "things" includes the Halloween treat bags, my daughter's birthday party (which falls between Halloween and Thanksgiving), and Christmas. I don't have an answer for Thanksgiving yet. Oh and did I mention we are trying to buy a business and house in another state, relocate my practice, and make the move before Christmas? My mind is full. 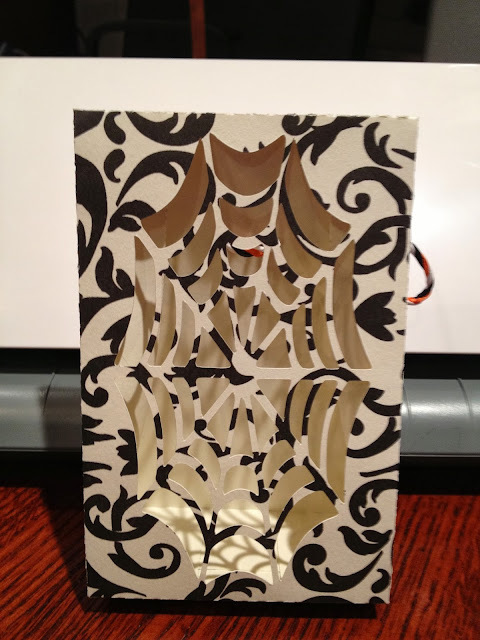 I put a black paper behind the spider web cutout in this picture so it is easier to see against the patterned paper. I won't use the paper once the bag is full of treats. Back to the Halloween treat bags. So now that I have my new handy dandy Silhouette Cameo die cut machine I am motivated to handle some of these tasks in a crafty way. 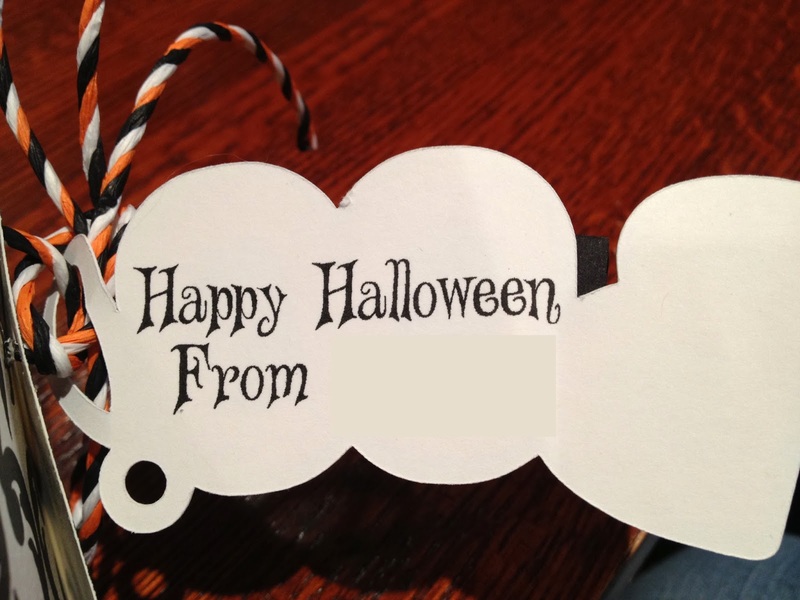 I found a few free cut files for various treat bags (from various holidays). Then I found a few Halloween themed cut files. After some editing, learning, and general toying around I came up with this spider web window treat bag. I like the spider web because you can see what is inside the bag but you don't need to cover the window with plastic or velum. Also the spider web is not inherently scary (or evil). OK when you walk into one unexpectedly, yes then the spider web is both scary and evil but that is a whole different issue. After making a few bags, I used this free cut file from www.svgcuts.com to make a tag which I tied to the bag with orange, black, and white raffia. The raffia goes through the top flap and the back of the back so the bag can be tied shut. On the back of the tag I printed "Happy Halloween" with my daughter's name in a Halloweeny font. I am now feeling very accomplished. Time to work on the birthday party. Stay tuned! These are great Halloween gift bags. Your daughter and her friends should love them. 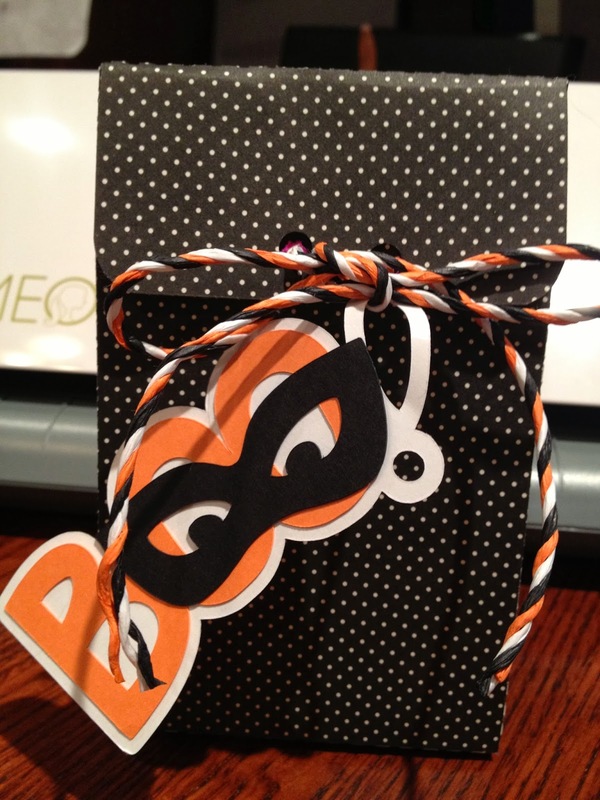 What cute Halloween treat bags! Well done. Stopping by from Farmgirl Friday...these are awesome treat bags! I have a few little neighbor kids that I was going to do something special for. i may have to steal your ideas!! Please do Dawna. This has become a tradition in our neighborhood and the little girls just love it. Love your treat bags! I've been on the fence about buying a Silhouette, and I really think this is going to push me on over to buying one. Heather I warn you it will become addicting. I am completely in love with mine. Thanks for stopping by! 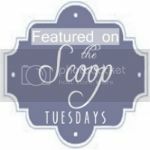 I just wanted to let you know you'll be a featured post on tomorrow's Motivation Monday link party. Congrats! Darling! I love your treat bags! Featuring your project on my facebook page today! Thanks for sharing on farmgirl Friday! Have a wonderful week... sounds as if you are very busy! Very cute! Thanks for sharing at the HomeAcre Hop! Thanks for sharing these with us at the HomeAcre Hop. We'd love to have you back again tomorrow. The bags are a gift all on their own!